Below are some fun photos of our time in Cocoa. 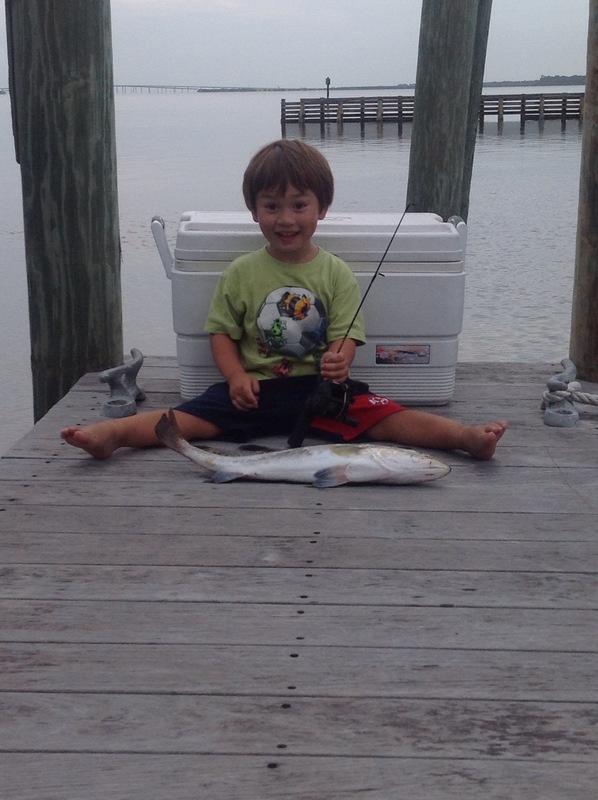 Capt’n in Training absolutely loves fishing! 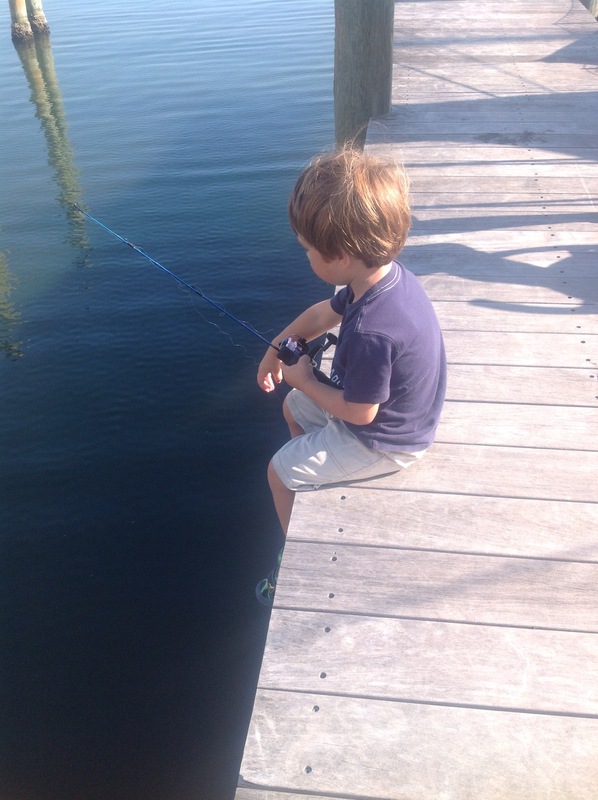 He can be seen spending a good 20 minutes (which is a long time for a two year old) sitting on the side of the dock “fishing.” Capt’n attached a lure (minus hook) to the fishing line. Capt’n caught a trout and Capt’n in Training was fascinated by it. Capt’n cooked it up for dinner and we had so much left that we gave the rest to a sailing neighbor. 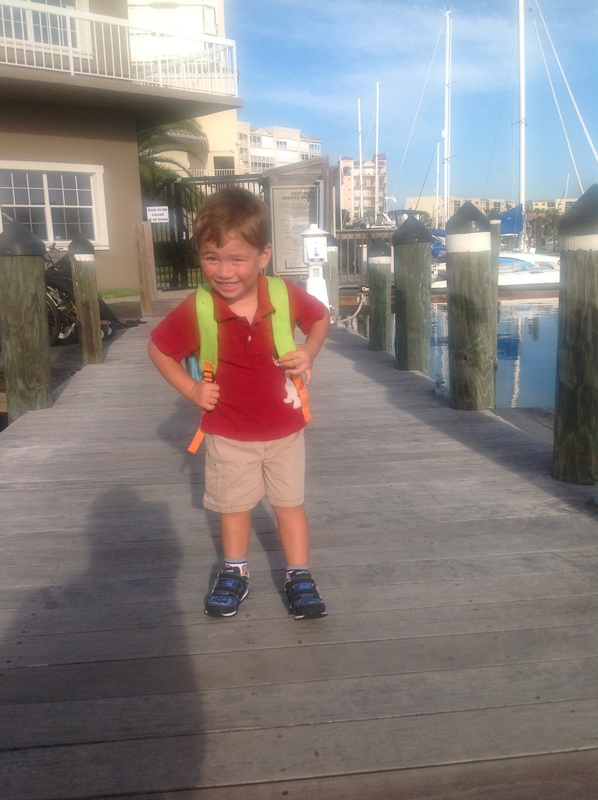 Since we are in Cocoa for a while (with me being pregnant and all), we enrolled Capt’n in Training in school. He goes to school two mornings a week and loves every minute of it! This photo was taken on his first day of school. What a big boy! 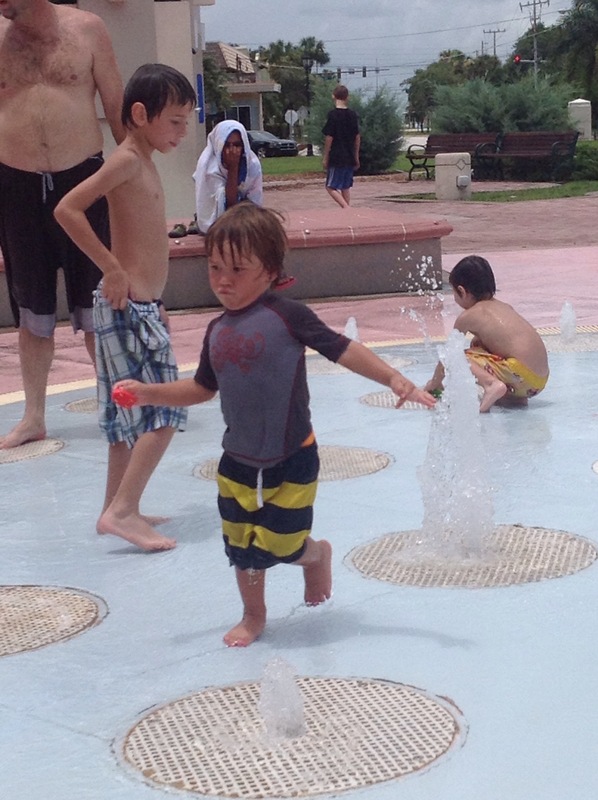 Florida was so hot this summer and fall, Capt’n in Training and I took daily trips to the local park’s water fountain. We had a lovely week together, catching up, telling cruising stories, playing with Capt’n in Training, taking them shopping, going out to eat and just spending quality time together. 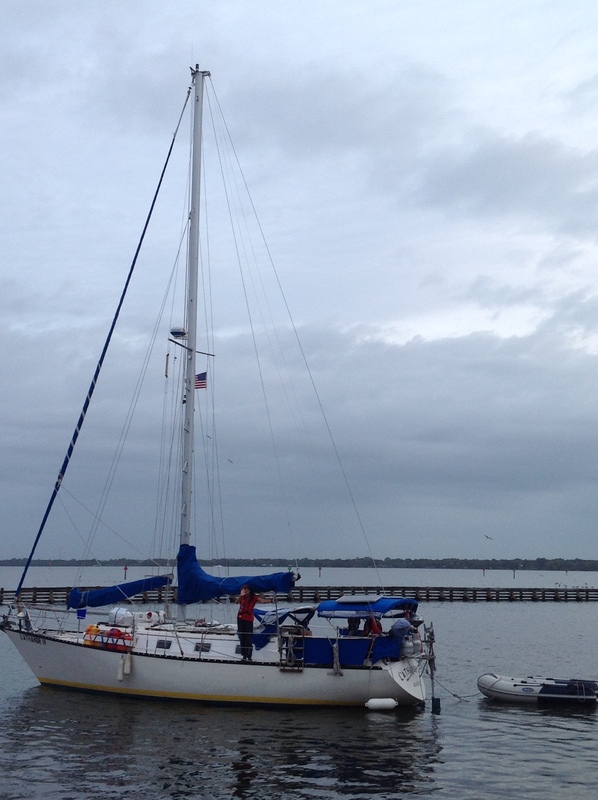 Our French friends left Cocoa Saturday morning for West Palm Beach and then the Bahamas. Their website is: domorochefort.com. I think you can also email them to be part of their email group for sailing updates. Dominique, Capt’n, and Capt’n in Training looking at pictures of some of Dominique’s paintings. I know that I haven’t written in MONTHS. We have had a lot going on. We felt as if we hit a crossroads of sort. We had to make a big decision: do we stay in Cocoa FL where we have been for a little while, or do we move on to some exotic destination? We have had many in depth discussions on our cruising plans – plans that included selling Dominion and moving back to Australia, Capt’n’s mother country, sailing to the Florida Keys (again), or venture off to somewhere in the Caribbean… After our discussion and no plans made, I discovered that I was pregnant. This exciting news was welcomed by Capt’n and I, but that did alter our plans a bit. So the decision was made for us. We decided to stay in Cocoa on the boat, move to a marina, and Capt’n started working a full time job to support his growing family. We are happy with this decision as we found a great church that we love, Capt’n in Training started going to school two days a week, and we were really happy in the Cocoa FL area. 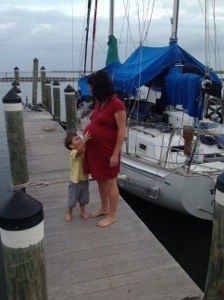 So these last nine months I have been coping with being pregnant and living on sailboat. 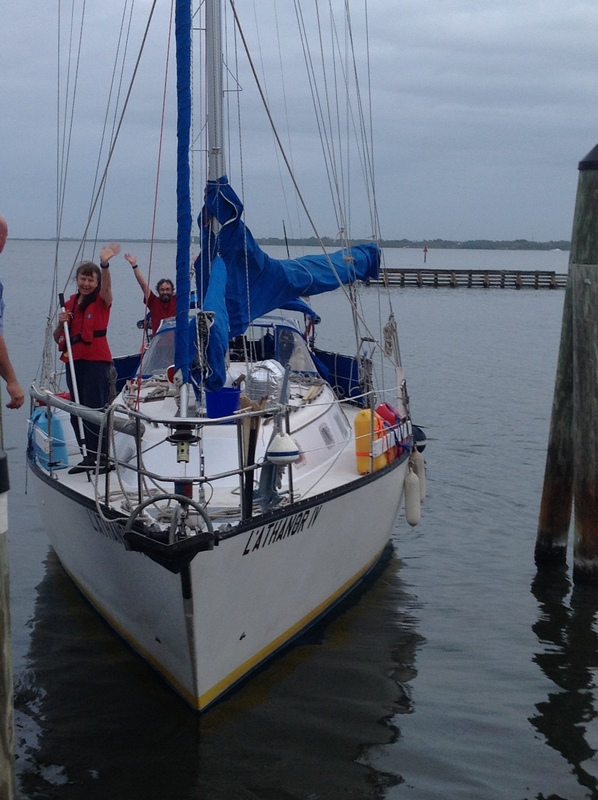 When we first moved aboard, Capt’n in Training was almost a year old, so I have never been pregnant living on a sailboat. 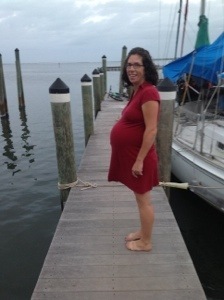 With my pregnancy with Capt’n in Training, I was able to day sail until my third trimester, when sitting on the dinghy and climbing aboard our 24’ sailboat became a little too difficult for me. But now I had no choice, I had to stay on the boat whether I liked it or not. I have become very sea sick since being pregnant with baby #2. The slightest boat movement sent me to bed for about 30 minutes! This had been a big challenge for me the entire pregnancy. When the weather was rough, or the boat was hit with a large wake, my best coping mechanism was to climb into the cockpit, look at the land, and breath the fresh air. As a preventative measure, I are a lot of ginger. I am not a huge fan of crystallized ginger, but I always had some on hand to eat . I also cook with a lot of ginger, drink ginger tea, and eat foods that contain ginger. This method is not perfect, but it has helped me. It is hard for me to distinguish between morning sickness and sea sickness since I felt the same for both! But how I dealt with morning sickness on the boat was the same that when I lived on land. I bought saltenes crackers in bulk and carried them wherever I went. I also always had some crackers in the aft cabin near our bed so I could eat some crackers before I got out of bed each morning. I felt like my morning sickness was worse with baby #2 because not only did I feel sick, but then the motion of the boat rocking simply added to it! I am very happy to say that my morning sickenss is gone, but I do feel sea sick still every time the boat rocks. Food cravings have been hard for me living on a boat. When I lived on land and I craved a certain type of food, I owned a car and also knew exactly where to buy said food item. However, living on the boat, not being so familiar with the area, and not having a car made fulfilling my food cravings a bit difficult. I said difficult, not impossible. So I was still able to find my waffles, breadsticks, ice cream, chicken fingers that I felt like I NEEDED, but it just took me a little longer to find them! I didn’t have the slightest idea on where I wanted to deliver baby #2. I did know that I did not want to deliver the baby on the boat, but I know there are many of you who either have delivered your baby on a boat, or would like to. My first choice was a birthing center but the closest center is in Orlando and I didn’t want to have to drive to Orlando for my appointments and then for the delivery. So I figured that I had to deliver in a hospital. I wasn’t upset about this option, especially since Capt’n in Training was born in a hospital and we had a great experience. But I did know that I wanted a midwife to deliver my baby. I found that one OB in the entire county supported midwives, so that made my decision very easy. I go to Hibiscus Woman’s care in Melbourne and will deliver at Holmes Regional Hospital in Melbourne. 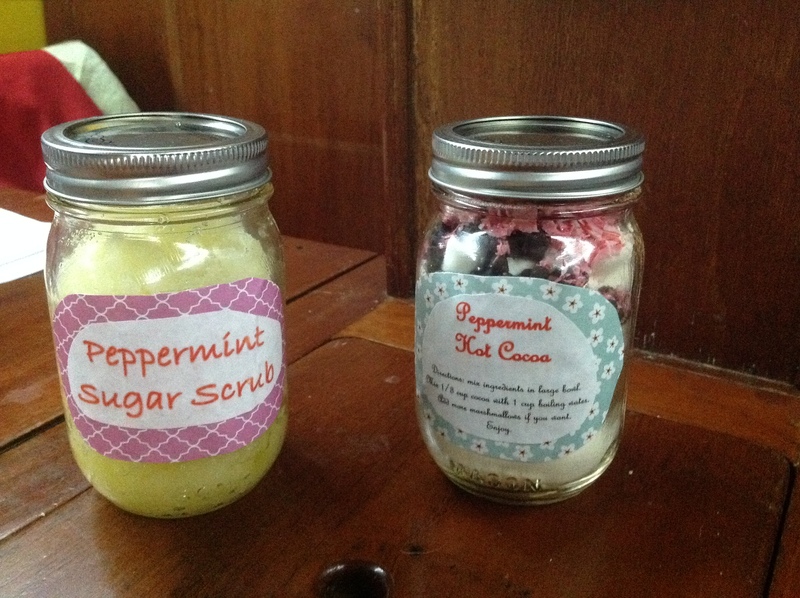 This time around I am also planning on getting a doula, and am now in the process of meeting with doulas. I am meeting with doulas who need to witness births before they can be a certified doula. This helps the doulas out and they often do this service for free, which helps me out. So far my experience with the midwives at Hibiscus Woman’s care has been great. There are four midwives in the practice so I will have met with all of them by the time it is time for baby #2 to arrive. I feel like my stomach is getting bigger by the day – well, it probably is. This growing girth makes me a little nervous about maneuvering around Dominion. Dominion does not have the widest companionways, and the galley is another space constraint, but so far I am doing just fine. I can also still climb up and down our companionway ladder and get on and off the boat easily. The biggest problem I have is bending down to picking items off from the floor, or to clean the floor. This is when I really try to get Capt’n in Training’s help and Capt’ns help. Capt’n in Training is sometimes very helpful in picking items up from off the floor, and other times he just adds to the mess! Other times I will wait until Capt’n gets home from work and he will clean the floor for me. He also has the jobs of cleaning the deck, filling the water tanks and filling the solar showers because I can’t walk on deck anymore. Since we spent summer in Florida, we have shade cloths covering the boat and it is tied to a lot of the rigging and I just can’t bend down and climb over these ties anymore. But honestly, I do not mind that I cannot do these chores anymore! Even doing laundry has become more work than I anticipated. It is hard for me to put our bags of laundry on the dock and then carry them to the marina laundry facilities. I will often wait for Capt’n to get home and bring the laundry to the clubhouse. Theoretically I can make it work by retrieving a marina dock cart and toting the cart up the elevator to the laundry, but then add an almost three year old toddler in the mix and it takes me about 30 minutes just to get to the laundry…. 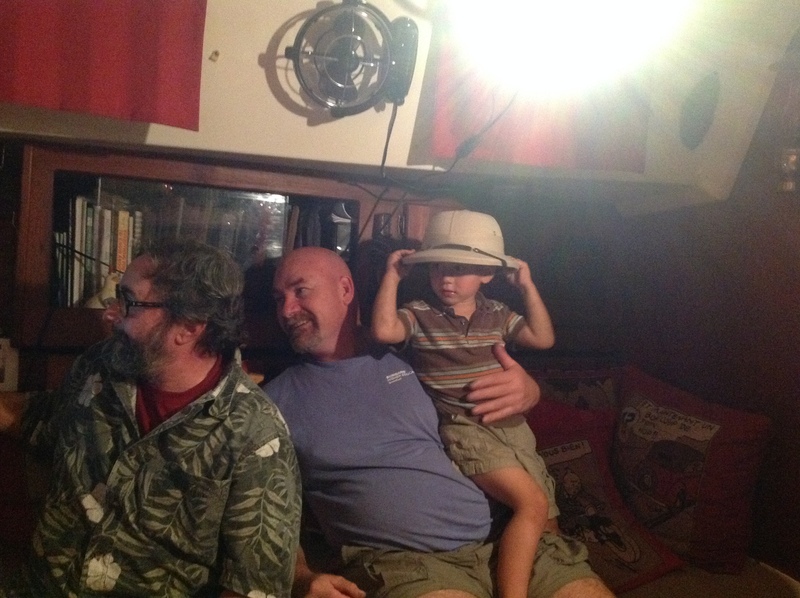 My new project is working on how to have a newborn live on a sailboat. Where the baby will sleep, where the baby will sit, where the baby will play. What they baby will sleep in, what the baby will sit on, and what the baby will play with. I am making some great headway, so I will post my conclusions and plans in the next posting. I guess I want to encourage all those people out there who are nervous about being pregnant on a boat, that it can be done! And has been done by lots and lots of women. And if I can do it, you certainly can do it! An update since I wrote a draft of this post but had not published it. I am now officially past my due date. 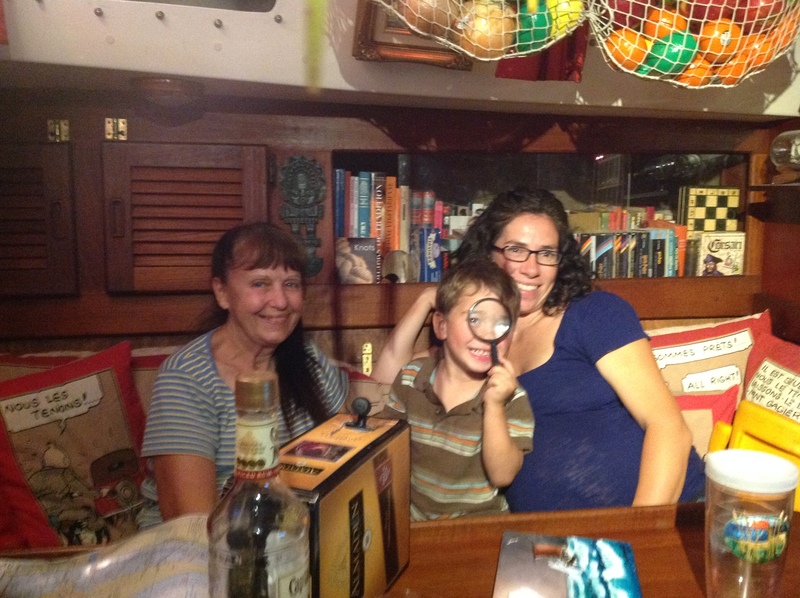 And we are eagerly awaiting the arrival of our First Mate. We have felt a ton of support from friends at the marina and friends at church. We cannot wait to meet First Mate. Here I am at 41 weeks pregnant. Capt’n in Training looking forward to meeting First Mate.